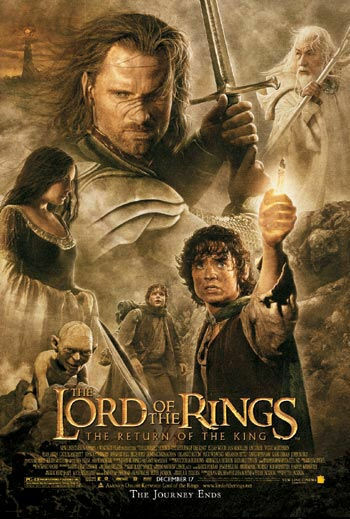 The Lord of the Rings: The Return of the King is a 2003 fantasy adventure film directed by Peter Jackson that is based on the second and third volumes of J. R. R. Tolkien's The Lord of the Rings and the concluding film in The Lord of the Rings film trilogy following The Fellowship of the Ring (2001) and The Two Towers (2002). The film also won four Golden Globes (including Best Picture for Drama and Best Director), five BAFTAs, two MTV Movie Awards, two Grammy Awards, nine Saturn Awards, the New York Film Critics Circle award for Best Picture, the Nebula Award for Best Script, and the Hugo Award for Best Dramatic Presentation, Long Form. It is the most-honoured fantasy film in history.